My boys absolutely LOVE helping me cook and it's a great bonding activity! Recently we did a kids' pick night. We pulled out all of our kid cookbooks and each boy chose a recipe. We went to the store for the ingredients we needed which they also really enjoyed! The menu was Crunchy Oven-Baked Chicken Toes, roated asparagus (my choice), ants on a log (celery with peanut butter and raisins), angel food cupcakes, and cherry punch. They helped with each part of the dinner and very proudly told my husband what was for dinner when he got home. It was a great evening! Make the breading: Pour the corn flakes into a pie pan or shallow dish. Crush the cereal up with your hands. Mix in bread crumbs, brown sugar, salt, pepper, and allspice. Drizzle the vegetable oil evenly over the breading. Toss and turn it to mix the oil all through the bread crumbs and crushed-up corn flakes. Pour the flour into another shallow dish, and the beaten eggs into a third dish. Coat (dip) the chicken in flour, then eggs, and then in the special crunchy breading. 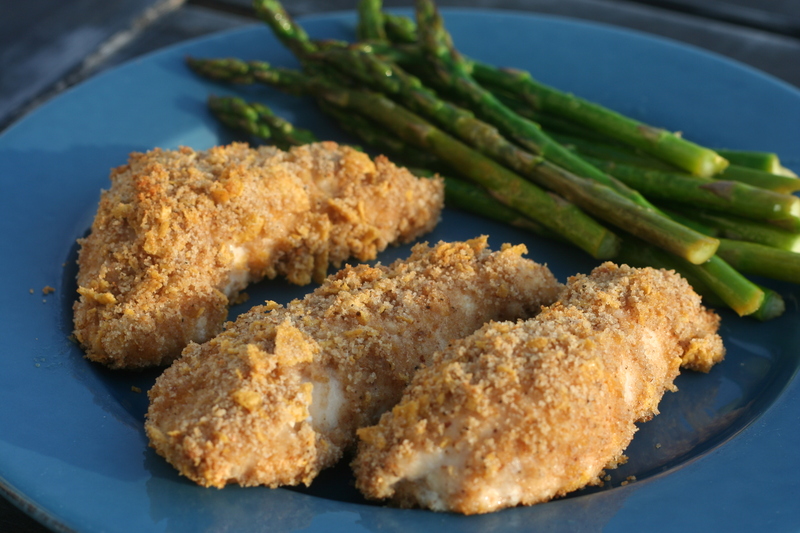 Arrange the chicken on a baking sheet coated with nonstick spray. Place the chicken in the oven and cook until crisp and brown all over, about 20 minutes (until juices run clear). Mix together the honey mustard and barbecue sauce in a small bowl. Enjoy with your chicken toes! These chicken strips look delicious. They're iconic and reminds me of my childhood. I really enjoyed reading this recipe. Wonderful post. I love chicken nuggets so must give these a try. They look scrumptious!